'Keep It Local' Campaign - support your local business to reduce the effects of 'Brexit'. Us ''Brits haven't had a war on our 'door step' in over 70 years (for which I am most grateful) so most of us do not know what it is like to be effected by such awful situations other than tales & recollections from our grandparents (if we so fortunate). Well let me tell you that our backs may be about to be 'against the wall' again in economic terms over the next 4 years with the impacts of Brexit yet to come. It is my view that we are likely to be punished by Europe to such an extent that we will probably suffer economically that will impact and reduce many peoples living standards or even their economic viability for living within our wonderful area to such an extent that they will fail and be forced into hardship. I think that we now need to pull together as 'us Brits' do best and attempt to mitigate these impacts by keeping our spending local. Local spending ensures that the 'money go round' is usually kept very local and in this way we all support each other. As the old saying goes - what goes around comes around - even the good stuff. I am personally very supportive of this concept and would therefore promote all attempts by the local folk of Marlow, Henley, High Wycombe and Maidenhead to try, if at all possible, to research and order supplies and services from local people that are also perhaps locally made. I would take this concept further to perhaps a UK based strategy. Why not ask your local supermarkets for UK produced food to be easily identifiable within the isles. Your next car purchase - why would anybody follow the 'old' herd and buy a German car (Bland Mans WHeels) when a Nissan assembled in the UK will support UK jobs? The same applies to Jaguar. Just do your research and you will find thousands of what sound like foreign products are actually made or assembled in the UK - Giving them your patronage supports jobs in the UK - so why would you NOT want to do this? Gone are the horrible Unionised days of crap UK products and services. Price is what you pay, value is what you receive. Therefore, within this section of my web site I actively promote and support all local suppliers and services and would urge others to do likewise. Even I struggle at times to make the correct UK supportive choices in my purchasing decisions but being conscious of this fact is the first battle to winning this coming economic war that I think is about to be unleashed. This section of my website is therefore dedicated to promoting and advertising local businesses and it is being added to every week. If you have found this page on my web site by sheer chance and would like to place your local business details here then simply send me an email with some text copy and I will consider it for inclusion within my next update. 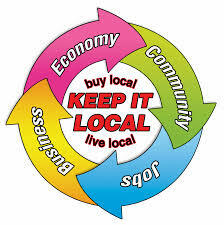 Reduce your purchasing of foreign products and services - KEEP IT LOCAL IF YOU ARE AT ALL ABLE. The French have been doing this for decades - They mainly only buy French built cars - You simply cannot purchase a New World wine in any ski resort in the French Alps. We need to take a trick or two from their book!